Worksheets: we all have to give them, we all hate doing it. Here are 5 no prep ways you can turn just about any lower level thinking or rote practice worksheet (like a multiple choice or fill-in-the-blank quiz, or math drill workbook page) into an activity that’s collaborative and includes higher level thinking skills. The strategies work for grades 3-12 (and can be modified for students who aren’t yet reading/writing independently). The best part? The activities are engaging for kids and FUN. Divide students up into teams of 4, and number them off so each person plays the role of Team Member 1,2,3, or 4. Ask a question from the worksheet and provide 30-60 seconds for each group to agree upon an answer. They should ensure every person on the team understands the reasoning, as they won’t know which team member will be responsible for answering the question. Then, randomly call out a number between 1 and 4. The person on each team whose number was called writes his or her answer on an individual dry erase board (or sheet of paper). Team members can NOT help in any way, or they will lose a point. On your signal, the designated student holds up his or her board/paper to show the answer, and you (or a student volunteer) can award and record points on the board. When time is up, the team with the most points wins. Have students stand in two rows facing each other. Choose a question or problem from a worksheet and read it aloud to the class. Give students 30-60 seconds to discuss their responses and reasoning with the person across from them. Give a signal for each student to then move one position to the right (the student without a partner at the end simply walks to the other end to find his or her new partner.) Continue playing until students have discussed all the questions. Challenge students to complete the worksheet and make an intentional error (an incorrect math calculation, out-of-order sequencing, grammatical or factual mistake in a written response, etc.) Then have students switch papers, mark the mistake, and discuss it. Group students into pairs, and have them place their desks together in a way that forms a large circle in the classroom (or clearly-defined rows.) Pass out the assignment you want students to complete and have each person in the pair choose to be Partner 1 or Partner 2. Set a timer for an appropriate amount of time for each pair to complete the first question or problem in the assignment, then sound a signal to let all the Partner 2’s know to move one seat down the row or clockwise while the Partner 1s stay in place. The new partnerships then work together to solve the next problem. Halfway through the assignment, announce that students should switch roles, and now the Partner 1s will rotate while the Partner 2s stay in place. Want more engaging, no prep activities? 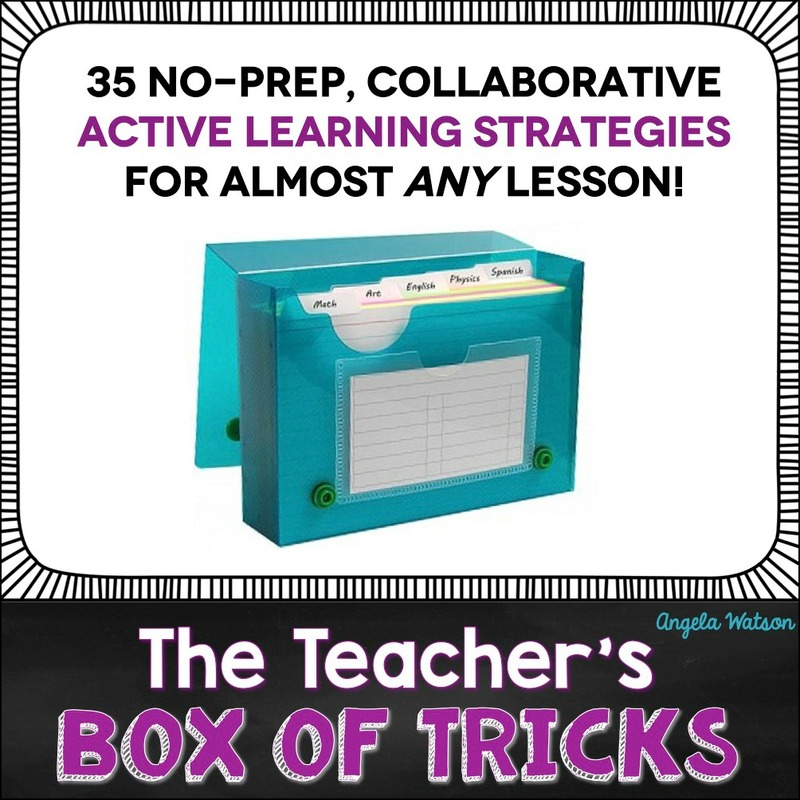 If lesson planning is taking you HOURS and yet you feel like all you do is giving boring test prep materials, check out The Teacher’s Box of Tricks. This is a resource I first created for members of The 40 Hour Teacher Workweek Club to help them save time with lesson planning, and I’ve just made it available in my TpT store. The 5 strategies in this post are part of The Teacher’s Box of Tricks. Why waste time reinventing the wheel and creating all your own activities from scratch? It takes YEARS for the average classroom teacher to develop a workable set of learning strategies that can be implemented on the spot and adapted intuitively for students’ needs. The Teacher’s Box of Tricks: a set of go-to active learning strategies that can be implemented (and adapted) on the spot. Like other experienced teachers, I’ve taught the same concepts and skills to students so many times that I’ve developed a huge repertoire of activities that I can build into my instructional time. I have activities that provide more scaffolding if the kids didn’t really seem to understand the lesson, and activities that will extend student learning if what I taught was too easy. I have activities that will take a long time if my lesson ends early, and activities that can be done quickly if my lesson takes too long. I call this mental list my teaching “box of tricks,” and I’ve refined it with hundreds of students over the course of the last 15 years. And now for the first time, I’ve written everything down in short, easy-to-follow directions so you can expand YOUR box of tricks immediately! 10 of the ideas will help you turn worksheets into engaging collaborative activities (like the examples in this post). The box of tricks comes in a list format AND sized to fit a 3×5 index card file box to create a literal box of tricks. Write your own ideas down on index cards and keep adding to your box of tricks over the years! I love these ideas! I am looking for ways to group the students without resistance. I love to have students collaborate but am often met with constant complaints from some, not all students about other members of their group. This really subtracts from the productivity of the activity. It also cuts into the time allotted. I’ll usually have students who are introverted and will politely ask if they can please work alone. It’s hard for me to force them into a group when I can clearly see how uncomfortable they are. I would truly appreciate suggestions as to how to avoid this. Unfortunately, It’s made me reluctant and a bit stressed when planning collaborative activities. I teach middle school and welcome suggestions! I have these exact same concerns with my high schoolers and would love to hear feedback on how to address the concerns. Thank you. Tell them in real life they cannot choose who to work with. They do not have to like their bosses, nor their coworkers. Hopefully they understand. Do you have any ideas for primary grades? I just switched from 3rd to 1st. Thanks!